Over the summer holidays Maxwell and I have been playing lots of games together. With the recent weather being poor, we found we had a lot of wet weather days. 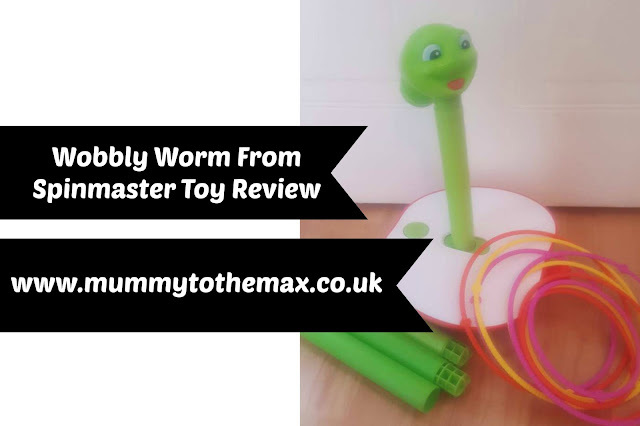 We were recently sent the Wobbly Worm game from Spinmaster to review. We were excited to receive the Wobbly Worm game as we loved the concept of it. As soon as the Wobbly Worm game arrived, we opened the box. We found that the game was easy to put together however one struggle that we did have was finding the larger sized batteries for the game and then finding a screwdriver to open the battery compartment. The screwdriver needed to be very thin however we did find a suitable set to open the battery compartment in a local supermarket. Due to this, it stopped game play straight away. Once we had sorted the battery issues out, we got on with playing the game. The whole aim of the game is to 'hoop the worm'. The game has three different levels of play. The levels are changed by making the Wobbly Worm taller or shorter. At the tallest point, the Wobbly Worm game stands at 90 cm tall. The game includes 3 sets of 3 different sized rings. Due to this, I think this game is really built for 3 players which is a nice welcome addition as we are a family of 3. The game is motorised and once the game is switched on Wobbly Worm rocks forwards and backwards making it more difficult to aim your hoops. 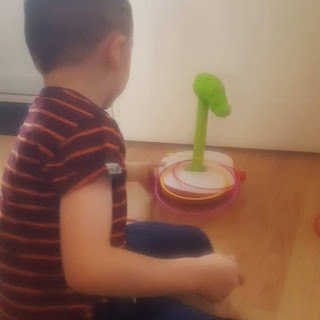 We found that we were unable to get any hoops around the Wobbly Worm when it stood at 90cm tall however on the lowest level, we managed to hook the hoops around the Wobbly Worm over and over again. 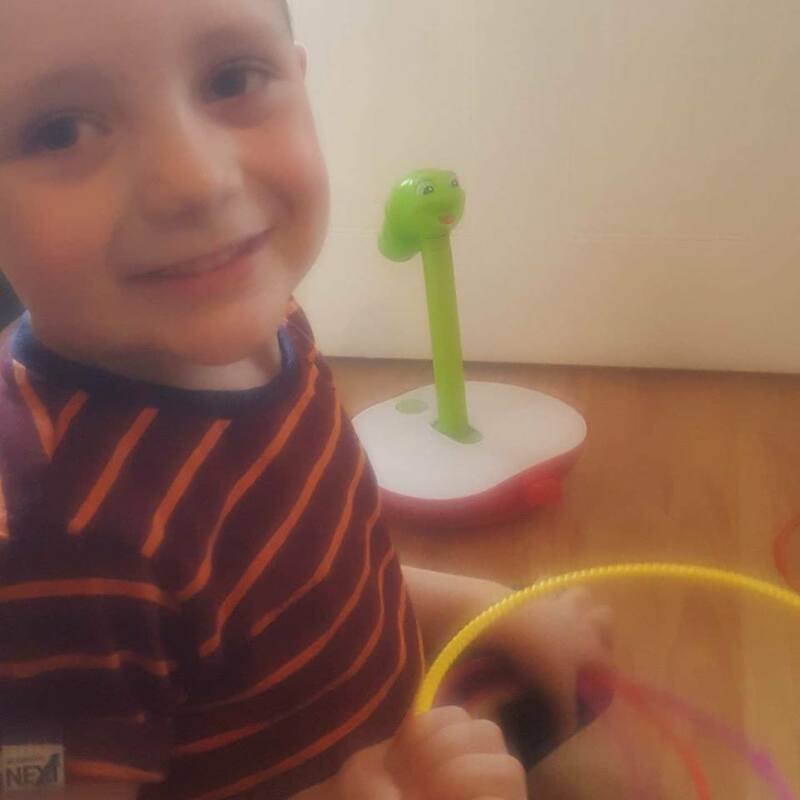 The Wobbly Worm game is bright, fun and a game which will keep children engaged. The game is aimed at children 3 + but has no small pieces with it. I feel that children younger than 3 could potentially use this toy but would require adult supervision when using it. The Wobbly Worm game can either be played inside or outside. I love this concept as it is perfect for beautiful summer days or wet and windy days. The game can be purchased from Amazon and has a RRP of £19.99. This game has been a huge hit in our household and we think it would make a brilliant gift for any child who loves games or loves fun sporty activities.